When the weather begins to grow warm you might hesitate to wear some of your crocheted accessories. The answer? Crochet lacier projects and you won’t have to sacrifice your style. 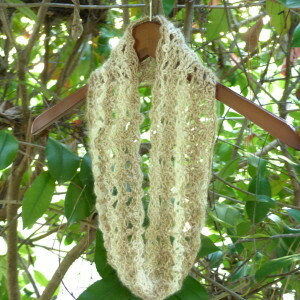 This cool summer cowl has an antique lace look, hence the French name for “old-fashioned”. But contrary to some belief, lacy doesn’t have to mean more difficult. The stitch pattern is fairly simple, and with a lovely variegated yarn, will present just the right amount of character. Wear it with any summer outfit for the perfect look! Gauge Swatch: 2’’w x 2’’h (5 cm x 5 cm) ch 9. I really enjoyed the way this cowl pattern turned out. Let me know what you think –and if you run into any snags– in the comments below! This entry was posted on Thursday, May 7th, 2015 at 12:00 AM by Amy	and is filed under Free Crochet Patterns. You can follow any responses to this entry through the RSS 2.0 feed. You can skip to the end and leave a response. Pinging is currently not allowed. Thanks, and I hope it works out for you! could you check round 3, not sure if I am having a senior blond moment. Gorgeous pattern, winter in my part of the world doesn’t get cold very much but this is perfect for those days when there is a bit of chill in the air. What exactly are you having difficulty with? I love this pattern, but wondered what changes I would need to make to use a thinner yarn(between a sport weight and a “regular” #3 weight.) I love the lacy texture and think it would show off this gorgeous yarn which I just bought! How long is the initial chain? Just so you know, the yarn I used was Red Heart Boutique Unforgettable in Cappuccino. I personally consider it closer to a sport yarn but the label says medium weight. I would first recommend trying a swatch with the yarn you want to use and check it against the gauge in the pattern. I don’t normally measure the length of the chain before I work the rest so I am afraid the only length I can give you is the Finished Size (32 inches in circumference). Let me know how it works out for you! This light and airy pattern is so pretty. Should that last instruction be “skip next ch-3 space”? No, it’s “skip next dc”. Rather than saying “skip next dc and ch-3 space”, saying “skip next dc, work into next dc” assumes you are going to skip the next ch-3 because it is before the “next dc” the pattern indicates. Hope this helps! I really do like this, and agree with previous comment – “this might be the one”! I think I’d rather make it as a straight scarf rather than a cowl. Think that would be a problem? Can I not just follow along with pattern – without joining into a circle? This is lacy without looking “high falootin’ ” and may try this with a silk yarn I have and that is calling me to be made into something pretty! The pattern will change slightly, mostly in the beginning and ending of each row. You will need to chain 113 to accommodate for the first sc. But it shouldn’t be too hard. I’d love to see it in silk! Hope it works out for you! It may be a while before I do this…am pushing hard to finish a CalKing Afghan for my bed (using mostly Sophie’s Universe) – and since this has been WIP for a while, I really want it DONE! But I will try to remember to send pic if I get it done.. I know what you mean, I’ve got a WIP afghan for MY bed that is taking me forever! 🙂 Too much to crochet! Good luck, though! Okay, have been keep up with the comments and now I wonder: is the pattern above all corrected? If so, I’ll use that and not the original which I copied to my computer files. Since I have not yet started mine (though time is getting closer as I’m itching to do it!) I want to make sure I work with totally corrected pattern – before I start. I also want to thank you for being so quick in responding to queries about this pattern! This seems to be a very popular scarf – good for you! it IS beautiful! I just realized that it should be “skip next sc”. I will correct that! Does this help you? Hello everyone! I realize that I made a small error on Round 3 and have since corrected it. Sorry for the inconvenience. I hope it works out for you now! Amy, at the end of Round 2, it says to sl st in the 3rd chain of the 6, then to chain 1, and sc in the first chain. I take it that is the next chain after the sc. Then it says skip the next chain 3 space which will be the sc,chain3,sc and then to dc,ch1,dc,chn1,dc, in next chain 3 space. That will be the chain 3 space before the dc. Should it read skip the next sc and work the dc in the sc,chn3,sc space, skip chain 3 and work sc,chn3,sc in the dc? The first ch-3 space you are to skip in Round 3 is referring to the leftover 3 chs from the previous rows ch-6 (which represents a dc and ch-3). So you are working the first sc in the same ch as you sl st to end Round 2. The (dc, ch 1, dc, ch 1, dc) belongs in the ch-3 between the two sc, and the (sc, ch 3, sc) belongs in the dc. Does this clarify? I began this pattern on the 27th. I see that you corrected the pattern and was happy to know that I was not going crazy, as I am a pretty accomplished crocheter. I would like to make it a bit longer but do not know how to extend the pattern. I think I will keep this scarf for myself as I usually give everything away. Creating the scarf in one long piece and then sewing it together would be a good idea. I am using Caron Simply Soft in Strawberry and an I hook. So far so good still using the old pattern. I will copy the new pattern and compare the corrections. Beautiful lacy loopy scarf! Thanks for sharing with us. If you want to extend the scarf just add a few more multiples. The stitch pattern is a multiple of 7, plus 1 for base chain if you are not going to crochet in the round. Good luck! Are you going to re-write the pattern for Round 3? I have made a couple of minor changes. Hope the bugs are worked out now! Your clarified pattern helped tremendously. I still worked the (sc, chain 3,sc) in the last chain 3 space and it all came together, made sense and looked good. It helped to know to sc in the chain as the first sc, chain 3 and sl st in that same sc. Thank you so much. I would like to use the lighter, airy yarn like yours looks like. What yarn did you use? I used Caron, and it wasn’t light like yours was. I also need for it to be a bit longer. Your scarf looks so much lacier. I’m happy it worked out for you, Linda! I used Red Heart’s Boutique Unforgettable in Cappuccino. It is still classified as medium weight yarn but it’s finer. Lion Brand’s Amazing is another like it but a little rougher because of the wool content. The pattern is corrected. I hope that there are no more bugs in it now. But you can let me know if there is anything I might have missed. Thank you, Amy, for posting what yarn you used. After the correction, mine whipped up in no time, but your’s still looked so much better, so I’m changing yarns, making it bigger and trying it again. Follow the corrected pattern, Carol D. It’s fine. I had to tear mine out over and over before, so I understand where you are coming from. Go for it! No problem, Linda. Glad I could help! Thanks, Amy – AND Linda for words of encouragement. Close to joining on my afghan (and I’m shaking in my boots thinking about it! Just having all this massive object on my lap will be a challenge – especially since temps have been high and hot in last few days! I may start this now – while I ponder just what join I’m going to do. Have some larger areas to fill on sides (the “drop” on the bed), so am considering using Celtic Lace for that…looks beautiful and may just fill the bill! Thanks all for the encouragement…I LOVE this site,..and Amy is just wonderful about replying – and FAST! Awesome! I’ll let you all know if when this gets done…I wound some of my Malabrigo Silky Merino and am ready to go….I just LOVE, LOVE, LOVE working with this yarn…not cheap for sure – but worth every cent. Thanks for sharing your ideas! Good luck! Hi. Round 3 is very clear but I’m confused where it says rounds 4-6 repeat rounds 2 and 3. How can I do 3 rows by repeating 2 rows? Or do I do row 2, row 3 and then row 2 again and finish off? Yes, for rows 4-6 you do row 2, then row 3, and then lastly row 2 to finish. Pretty! And it was so quick! I uses Patons sequin lace. Simple and pretty. Thank you!